In Sigma IDE, a Sigma Project is an aggregation of resources, where a Resource represents an actual entity on the connected AWS account, such as a S3 bucket, an API Gateway endpoint, etc. From the project&apos;s point of view, a resource can be either a New Resource or an Existing Resource. In the context of a Sigma project, a resources is considered as New if it is/was created by the current project itself. On the other hand, ) or a resources is considered as Existing if it has been created by an external entity; e.g. the user himself, a different Sigma project, or an entirely unrelated third-party application. This distinction follows from the fact that a Sigma project maintains its resources via an AWS CloudFormation stack, which is inherently limited to managing resources that were created by itself. Hence a Sigma project has full control over New resources (those that were created by, and hence belong to, the project&apos;s stack) but only partial control over Existing resources (limited to configuring them as trigger points, and allowing programmatic access to them via the user&apos;s application). In almost all component configuration panels in Sigma, there are 2 separate tabs to define either a new resource of that component type or to use an existing one. When a new resource is defined (e.g. 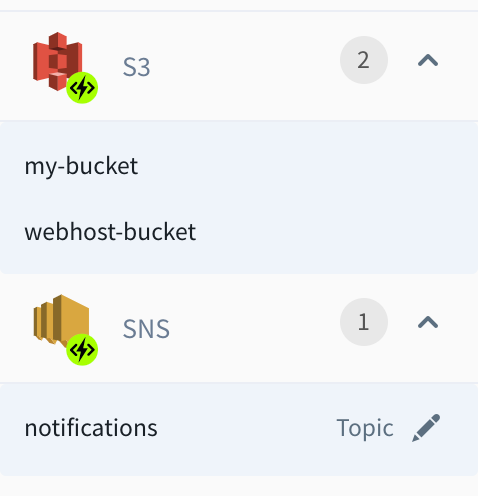 a new S3 bucket), from next time onwards it will also be listed under existing resources list (e.g. existing buckets list), but will be marked as (New). Usage of resources in a Sigma project also falls into two categories: Triggers and Operations. Triggers, as the name implies, correspond to the use of a resource for triggering a user&apos;s lambda function. Operations represent the usage of a resource inside the lambda function logic (such as an AWS API call). A lambda can have any number of triggers and can access/operate on any number of resources (as operations). One resource may be associated with multiple triggers and also be involved in multiple operations. For example, if you write a function for processing files dropped into a S3 bucket, you will usually set up an S3 trigger for the bucket, and perform getObject (and probably putObject) operations on the bucket from within the function code. In this case, the same bucket resource serves as a trigger as well as a resource. Depending on the type of the resource, it can be used either as a trigger, or for operations or for both. Following is a list of currently available resource types and their possible usages. When a resource is defined in Sigma as a trigger or for an operation, it will be listed under its resource type on the left resource panel. Such an already defined resource can be reused for another operation/trigger by directly dragging it to the editor instead of dragging the root resource type. Depending on the resource type, configurations of some resources can be modified through the resource panel. Such editable resources have an edit button in-front of them, and the resource configuration panel can be opened by clicking on that button.